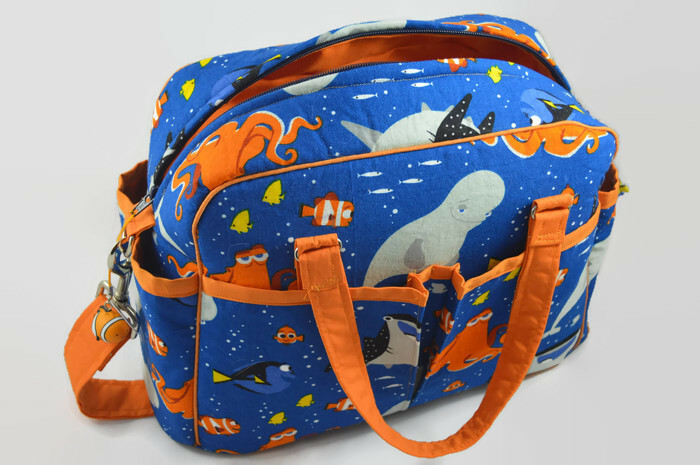 My partner found this adorable Finding Dory fabric at Joann’s a few months ago and suggested that I make his sister a diaper bag for her baby shower. Perfect idea. I loved the fabric and could just picture the bright orange lining and trim. 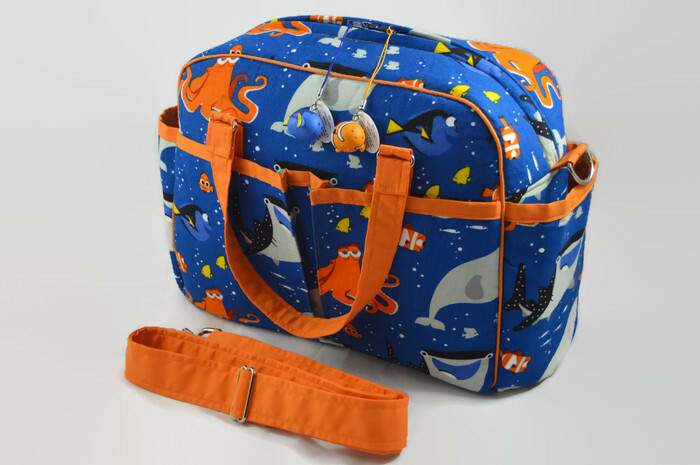 After doing a bunch of research, I picked out Swoon Patterns’s Belle Baby Bag to use to make the bag. 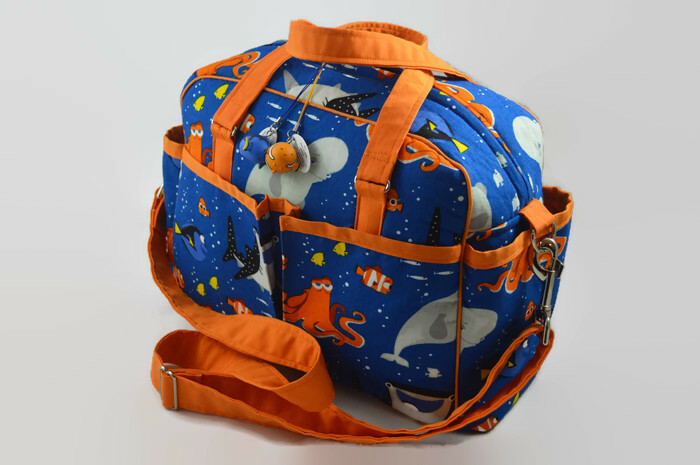 I loved the design with all the pockets on the inside and outside, and it even had instructions to make stroller clips so the bag can hang on the stroller handles. Functional and pretty. The Belle is one of the most difficult things I have ever made… and that includes almost all of my costumes. Yes, including Trainer Yuna and GW2 Exalted armor! I want to stress the difficulty had nothing to do with the pattern itself — the instructions are clear and include easy to understand diagrams that help a lot. I had just never sewn with foam interfacing before! Joining together so many layers of fabric, piping, SF101 interfacing, and foam interfacing was just… wow. I think I went through at least five needles on this baby. But it was all worth it. The structure on this thing is incredible. The piping looks so professional (I think I went over each seam 3 times to get it perfect). And I was right about orange contrast being just right. We topped the bag off with Dory and Nemo Tsum Tsum charms from the Tsum Tsum arcade game, which we played with the new mom when we visited last year! So the whole thing turned out perfect, and she totally loved it!! I can only recommend the Belle for sewists with a lot of experience, but brave intermediate sewists will learn a lot from this pattern — just be patient and don’t stress if you mess up or end up losing materials. However, Swoon patterns in general are fantastic, and they have something for everybody. Definitely check out their pattern shop — there are even free patterns if you want to see what they’re all about. I am just starting this bag for my granddaughter. You did a beautiful job. Now I’m getting nervous, because I thought the same thing as I was going over the pattern. It seems like a lot of layers. I just finished a cupcake backpack and that was a bear, but it turned out really cute.